Mitchum Triple Odor Defense technology. Provides a shield against odour from heat, motion and stress. Expertly formulated for ultra-powerful 48 hour sweat + odor control. Goes on invisible, leaving no white residue on skin. Dermatologist tested. Alcohol free. 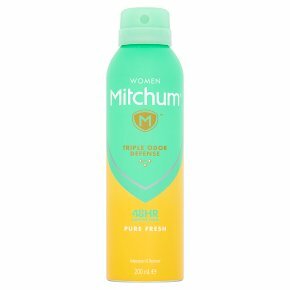 Mitchum Women Triple Odor Defense Pure Fresh 48HR Protection Anti-Perspirant & Deodorant Aerosol 200ml, expertly formulated for ultra-powerful 48 hour sweat + odor control, so you can feel your most confident. Now introducing, Mitchum Triple Odor Defense Technology, a shield against odor from heat, motion and stress. Directions: Always shake well before use. Hold 15 cm from underarm and spray.